On Left of your screen, you have a Box where you can sign up for Email Alerts. 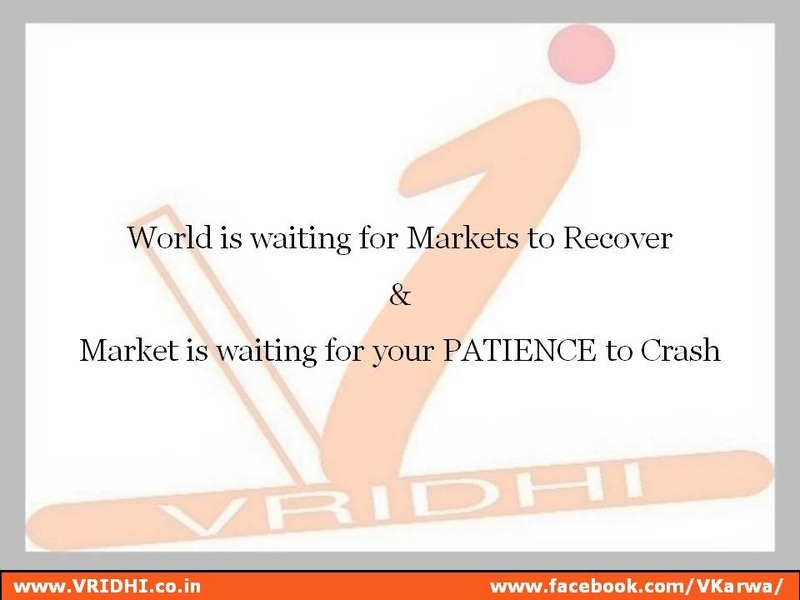 Subscribe and stay connected with VRIDHI. When the markets crash, let traders cry. Not you. A big market move is accompanied by lots of excitement. Usually the excitement is of traders who are either kissing their screens or holding their heads in despair. Human beings tend to mimic the emotions of others near them—try being sober around a person who is laughing uncontrollably or try to not tear up when your friend is crying uncontrollably and see how tough it is not to react in empathy. Especially when there is a large market crash, the images on TV, the messages on social media and the newspapers all contribute to average people feeling that a big catastrophe has happened and they need to worry. And here is the strange thing: the real investors—that long-term equity investor who has a diversified portfolio of stocks and funds—simply have an average day at work. It is the punters, the market timers, the tip-seekers who get deeply influenced by the reactions of a market crash and spread the emotional contagion. Strangely, the most affected are people who have no stake or have very small sums invested. Since the culture of long-term equity investing is still new in India, there are concerns about markets with new investors and those still to start making a financial plan. They worry—maybe this time it is different and the world economy will collapse with all my money in it; I’m safer in fixed deposits and land. What they forget is the slow slide of real value of money in a fixed deposit, which post tax and inflation, usually gives negative returns at the top tax bracket. Real estate is a messy, lumpy, black money-bearing, costly investment that, on an average, gives returns that are lower than equity. So, how bad can markets get? Let’s look at bad stock market events in the past in India. Let’s take Sensex closing rates from 3 April 1979 till 24 August 2015. We see that it has fallen by 6% in a single day 19 times, including the fall on Monday, 24 August 2015. It fell 5% in a day 40 times, and 4% 90 times. It fell 11% twice and, the worst, 13% in a single day, once in April 1992. How does this look when we look at up-moves? Markets have gained 6% in a single day 24 times over this 36-year period, have been up 44 times by 5% in a day, and a huge 92 times been up 4% in a day. The biggest one-day move was 17% in May 2009 when markets reacted to the Left not making it to UPA-II (as an aside: little did markets know!). Markets go up and markets go down. When this happens over a short period of a day it makes news, a slow slide of 6% over six months is less scary but is equally harmful to your money. Looking at the ‘markets are up more than they are down’ data, should we conclude that this crash will quickly end and markets will bounce back quickly? Nobody knows. That’s the thing with equity investing—the time horizon has to be long enough to stomach the risk of a downturn and volatility. Remember that markets can be depressed for really long periods. After the worst one-day crash of 13% in a day, the markets took over seven years to get back to sustained recovery—with lots of volatility in the interim. All those stock pickers who are rushing in to buy as the markets have crashed should remember this—market recoveries can be long and painful. All those rushing in to sell should remember that market recoveries can be short and quick. You need to be a bit of a boring kind of person to invest in the stock market. Not so excited at a fall that you rush in to buy, or so afraid that you rush in to sell. Financial planning has rules—if you follow them, you don’t worry about sudden market moves. This is a great time for the small band of intrepid financial planners of India who have solidly worked on building a client base on the ‘right-selling’ financial planning principle over the past 10 years. To turn away an 80% first-premium commission on an investment of a few lakhs is not the easiest thing to do, especially when your business is new. Some of the financial planners on my Twitter timeline reported having a normal day at work—hardly any calls from panicked clients; others spoke of calls where people just wanted reassurance. Right selling means managing expectations of the clients and constructing a portfolio that rides out market storms. Those who built the foundation right are sitting with great client books today. They say Sensex will touch 40000. Will it? My answer remains the same—don’t watch the index; it tells you almost nothing. At its very simplest, a stock market index is an average reflection of the prices of 30 or 50 or 100 or 500 stocks. Looking at the index level to invest or sell is uneducated because the information that an index value carries has very little to do with what the future holds. Rising or falling stock market indices simply tell you the direction of the mood in a stock market. To understand this better, let’s look at the price of a single stock. The price of the stock, too, has no information in it to predict the future—it is simply the price somebody is paying for one share to somebody who is selling that one share. Very simplistically, when there are more buyers than sellers, the price begins to rise. How high it will rise depends (again very simplistically) on the value of the share. Which brings us to the question: why does a share have a value at all? Isn’t it a punt where speculators make it go up and down? Speculators may affect share prices in the short term, but the overall direction of prices depends on the ‘value’ of the share. When you buy a share in a company you are agreeing to take the risk the entrepreneur takes to the extent of your holding in that company. Therefore, it is called ‘share’. You share her risk. If you bought the company’s bonds, you would get a predictable return every year. But when you ‘share’ the risk, both the upside and the downside are much larger. As an investor, you are hoping that the company you have funded (in however infinitesimal manner) will make profits at an increasing rate. If it makes Rs.1 crore this year, it will make Rs.1.5 crore the next year and Rs.3 crore the year after, and so on. As an investor, you can see your share of profits as earning per share and the company also declares dividend from the profits. If the total number of shares is 100 and the company makes a net profit of Rs.10,000, your one share has ‘earned’ Rs.100 (assume you bought the share for Rs.10). But you don’t get this money in your hand. Now suppose your friend wants to buy your share. Will you sell for Rs.10, or Rs.100, or more? More, right? Because you think that next year, the profit will be Rs.20,000, taking your share of the profit to Rs.200. If you sell at Rs.200, then the ‘valuation’ (price-earnings) of your share is Rs.200 (price) divided by 100 (earning per share), or 2. This means your friend is buying your share knowing that at the current level of profit, it will take him two years to recoup his investment. But she buys at twice the current value hoping for an uptick in profit. Now expand this example to all the stocks in the index. The absolute value of the index has no information in it for the future direction. The valuation of the index does give a pointer. The current ‘discounting’ or price divided by earning per share of the Sensex is near to its 10-year historical average of 17.8. If prices keep rising without the earnings growing, the market will ‘correct’ and come back to a more reasonable level. But if the earnings grow, there is room for prices to keep rising. Do you see why markets are up? In the expectation of India being open for business again after a 10-year period of a reversal to the 1970s business-is-bad philosophy. This will eventually translate into profits and earnings growth, which will reflect on the market. So if you really have to watch something, watch the ‘value’ of the market and the prospects of India coming out of the current growth decline rather than punt about stock market levels. Now that election results are out, what happens next? When the stock markets opened for trade on Friday, 16 May, early leads were suggesting that the outcome of the general election was going to be much better than what the street had expected. As a result, the market opened with a gap up and, at one point, the S&P BSE Sensex was up over 1,400 points compared with its previous close and crossed the 25,000 mark, though it gave up some of the gains later in the day on profit booking. BSE Sensex ended the day’s trade with a gain of 0.90%, with cyclical sector indices such as Realty and Bankex gaining 5.97% and 4.39%, respectively. Before the markets closed, the Bharatiya Janata Party (BJP)-led National Democratic Alliance (NDA) had either won or was leading in 340 out of the 543 seats. However, what surprised the markets positively was that BJP on its own accord was either leading or had won 283 seats, which is sufficient to form government at the Centre. “The outcome is much better than what the market was expecting,” said S. Naren, chief investment officer, ICICI Prudential Asset Management Co. Ltd, adding that there is scope for Indian equity markets to get re-rated in the short-term. Mid-caps and infrastructure sector would do well from here on, said Naren. This view is shared by others. “Markets can go up 20% from the present level,” said Sudip Bandyopadhyay, managing director and chief executive officer, Destimoney Securities Pvt. Ltd, who is bullish on select companies in the capital goods and infrastructure sectors. Clearly, the mandate in favour of BJP and NDA is much stronger than what anyone on the street had expected. It is for the first time since 1984 that a single party has managed to win so many seats in the lower house of the Indian Parliament. A clear majority in the Lok Sabha will help the new government push legislations and reforms. Therefore, there will be high expectations from the government, which is being reflected in the stock prices. BSE Sensex has gained about 8% in the last one week. So, where will the markets go from here? “Over the past decade, a fragmented coalition with differing economic ideologies had been the key reason for the economic malaise. The historic verdict, hence, justifies a re-rating of the Indian equity markets,” said a note from Deutsche Bank. Since the market had already run up a lot in anticipation of the election outcome, there is a chance that it takes a breather before making the next move. “Markets can consolidate,” said Andrew Holland, chief executive officer, Ambit Investment Advisory Pvt. Ltd, adding that markets will now look forward to the formation of the government and will be keen to see who takes over as the finance minister. Now that the much-watched general elections are over, and the outcome is clear, the next event that the market will look forward to is the Union budget. In terms of risks, said Bandyopadhyay, poor monsoon and rise in interest rates in the US can still upset the market. A decisive majority in the favour of BJP-led NDA is likely to keep the street upbeat in the near term and the market will now focus on the formation of the new government, and how it deals with some of the marco economic challenges such as containing consumer price inflation and kick-starting the investment cycle, which will help revive growth. All eyes are now on the budget. Why is Sensex at all Time High? Despite economic woes Sensex is at record high; here’s why There is some method to the market’s madness. If the Sensex today has crossed its all time high it is because market perceptions have changed. There are five reasons why the markets have begun ordering the bubbly despite the economic gloom. Why is the Sensex on a tear when there is no sign that growth is picking up or corporate profitability is about to turn around? About the only two positives are export growth and a bountiful monsoon, but industrial output in stagnant, the investment cycle is yet to pick up, consumer confidence is weak, and inflation is still edging up and up. However, there is some method to the market’s madness. If the Sensex today has crossed its all time high it is because market perceptions have changed. There are five reasons why the markets have begun ordering the bubbly despite the economic gloom. #1: It is discounting the second half. The markets are beginning to discount what will happen in the second half of the year- when election spending and rural demand will pick up. The markets reckon that the economy may have bottomed out for now, and that the coming two quarters will be much better in terms of economic and corporate performance. The strengthening of the rupee is an early signal of that. #2: Adjusting for inflation. The markets also know that share prices have not adjusted for inflation in the last five years. Investors who bought the Sensex in January 2008 have made zero or negative returns. Merely adjusting for inflation since early 2008, market prices would have to correct upwards by at least 30-40 percent some time. This suggests that the Sensex should be somewhere between 25,000-30,000 over the next one year, if all goes well. It does not mean the Sensex has to rise, but the downside risks from here look smaller than they did in 2008 and 2010 when the Sensex last hit 21k levels. #3: The Fed taper is now further away. Day before yesterday, the US Fed hinted that it was still not comfortable reducing its bond buying programme in view of weak growth. "Available data suggest that household spending and business fixed investment advanced, while the recovery in the housing sector slowed somewhat in recent months," the policy-setting Federal Open Market Committee said. "Fiscal policy is restraining economic growth." This means the taper has been pushed back to probably the first or second quarter of 2014. But the recent US government shutdown following the tug-of-war between President Obama and the Republicans has caused some further economic damage. The market may be betting that the taper may be even further delayed. This means liquidity will not be an issue for as long as one can see. October has already seen USD 1 billion of inflows into equity. #4: Election results on the horizon. The markets are now beginning to see what might happen beyond the 2014 elections. If Narendra Modi scores big – as some opinion polls are beginning to indicate- the markets will soar. But even if he doesn’t, the markets expect the new government to be more committed to reform for the simple reason that there is no alternative to it. 20-21k is the floor if the BJP does not win; 30k is probably the target for the first year of a BJP-led government. #5: Interest rates may be peaking. Stock prices and interest rates are inversely correlated. Even though inflation has not peaked, the betting is that by early next year, or at least by April, interest rates will start falling. If that happens, stocks should start picking up steam again. On Thursday, RBI governor Raghuram Rajan said "I won’t say that we have a set of rate hikes in mind..We think we have done enough given what we know about the economy to wait and watch and see what happens." None of this is guaranteed, of course, but hope springs eternal in the market’s breast. Especially when the market has been starved for returns for nearly half a decade. The markets always move in advance of reality. Some investors are taking a close look at the Rajiv Gandhi Equity Savings Scheme (RGESS ) this tax-saving season. Taxpayers with gross annual income of.10 lakh or less can invest up to Rs.50,000 under Section 80CCG in the scheme. The benefit is available to first time investors for investments through their demat accounts opened on or after November 23,2012, or demat accounts which have not yet been used for equity investments. RGESS offers tax benefits over and above that one gets under Section 80C of the I-T Act which is available for savings or investments up to.1 lakh.Since this scheme gives you an added tax benefit,investors with an appetite for equities and keen to build an equity portfolio for the long term can invest in this scheme, says Vishal Dhawan, chief financial planner at Plan Ahead Wealth Advisors.As per the provisions of the scheme,you can invest in direct equities (any stock belonging to BSE 100 or NSE CNX 100, equity shares of Maharatnas or Navratnas ) or you can buy units of exchange traded funds (ETFs) investing in RGESS eligible shares provided these units are listed and traded on stock exchanges and settled through depository mechanism. Investments in individual stocks carry higher risk as compared to investments in equity mutual funds. We recommend first-time investors to invest through the mutual fund route, says Aseem Dhru, MD & CEO, HDFC Securities. Many investment advisors have reservations about individuals investing in individual stocks under RGESS.It is very difficult for the retail investors to predict individual stock price and how they will behave, says S Shankar,chief financial planner at Credo Capital.Take the example of a couple of Nifty stocks.In 2012,IDFC gained 87% while BPCL lost 25%.So if you buy a wrong stock,you could end up losing a lot of money.As compared to this,a mutual fund invests in a basket of stocks thereby lowering risk.Equity mutual funds offer the benefits of diversification which helps lower risk and optimise return, says S Shankar.He advises investors to invest in RGESS by using the ETF route. As per RGESS,if you invest.50,000,you shall get a 50% deduction of.25,000 under this scheme.Now if your income is taxed at 10%,you save a tax of.2,500; while if you are in the 20% tax bracket,you will save.5,000.In case you were to buy stocks under this scheme,keep in mind the brokerage costs that you may have to shell out in addition to the annual depository maintenance costs.For example,if you buy shares worth.50,000,you shall pay a brokerage of.250 and an STT (Securities Transaction Tax ) of another 0.1%,or.50.Keep these costs in mind before investing. As of now, if you happen to miss this scheme,there is no clarity as to whether this scheme will be extended to the next financial year. All those looking to invest in RGESS,need to open a demat account with a depository participant and a broking account with a recognised member of a stock exchange.The depository will certify your new investor status at the time of designating your account as a demat RGESS account.Once this is done you can buy stocks from BSE 100,NSE CNX 100,Maharatnas or Navratnas or exchange traded funds (ETFs) as specified under the scheme.An investor can invest in RGESS securities / ETFs as many times as he wants in the first year of investment.However,tax benefits are allowed only in the first year of RGESS investments.Even if one claims a small amount in deduction in first year,no deductions can be claimed in subsequent years.The investment made under RGESS is locked in for a total period of three years.However,as per the terms of the scheme,only the first year is a fixed lock-in.In the subsequent two years,the investment is subject to a flexible lock-in.During this flexible lock-in period,the investor has a freedom to book profit or alter the securities in her /his portfolio provided the value of securities in the demat account is maintained or is equal to the amount declared as investment under RGESS in the first year.You will lose tax benefits availed under Section 80CCG of the I-T Act if you fail to comply with the lock-in requirements.